Electronic components maker Pulse Electronics has introduced an ultrathin NFC antenna that measures 35mm by 50mm by just 0.133mm, making it 28% slimmer than its previous version. 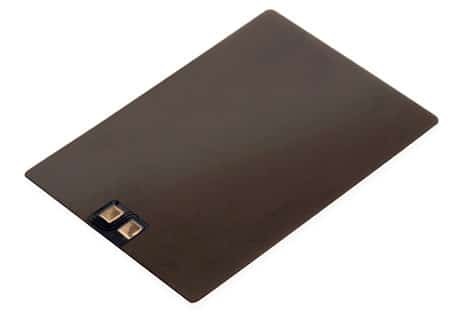 The antenna is made of ferrite sheet material, meets the EMVCo 40mm reading distance requirement and is suitable for use in a range of mobile devices, including NFC phones, phablets and tablets. The 2mm square contact pads are mounted side by side within the antenna area.